The Service allows you to solicit pool maintenance services. If you are a user who signs up for the Service, will create a personalized account, which includes a unique username and a password to access the Service and to receive messages from the Company. 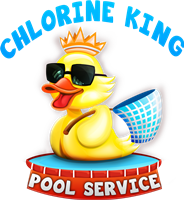 You agree to notify Chlorine King Pool Service immediately of any unauthorized use of your password and/or account. The Company will not be responsible for any liabilities, losses, or damages arising out of the unauthorized use of your member name, password and/or account. (b) DMCA Take-Down Notices. If you are a copyright owner or an agent thereof and believe, in good faith, that any materials provided on the Service infringe upon your copyrights, you may submit a notification pursuant to the Digital Millennium Copyright Act (see 17 U.S.C 512) (“DMCA”) by sending the following information in writing to the Company’s designated copyright agent. You acknowledge and agree that we and our licencors retain ownership of all intellectual property rights of any kind related to the Service, including applicable copyrights, trademarks and other proprietary rights. Other product and company names that are mentioned on the Service may be trademarks of their respective owners. We reserve all rights that are not expressly granted to you under this Agreement. THE SERVICE, IS PROVIDED “AS IS,” WITHOUT WARRANTY OF ANY KIND. WITHOUT LIMITING THE FOREGOING, THE COMPANY EXPRESSLY DISCLAIMS ALL WARRANTIES, WHETHER EXPRESS, IMPLIED OR STATUTORY, REGARDING THE SERVICE INCLUDING WITHOUT LIMITATION ANY WARRANTY OF MERCHANT ABILITY, FITNESS FOR A PARTICULAR PURPOSE, TITLE, SECURITY, ACCURACY AND NON-INFRINGEMENT. WITHOUT LIMITING THE FOREGOING, THE COMPANY MAKES NO WARRANTY OR REPRESENTATION THAT ACCESS TO OR OPERATION OF THE SERVICE WILL BE UNINTERRUPTED OR ERROR FREE. YOU ASSUME FULL RESPONSIBILITY AND RISK OF LOSS RESULTING FROM YOUR DOWNLOADING AND/OR USE OF FILES, INFORMATION, CONTENT OR OTHER MATERIAL OBTAINED FROM THE SERVICE. SOME JURISDICTIONS LIMIT OR DO NOT PERMIT DISCLAIMERS OF WARRANTY, SO THIS PROVISION MAY NOT APPLY TO YOU.